Evidently I’m now addicted to making my own Chinese takeout food. After 10 years of not being able to eat Chinese food, I suddenly can’t get enough! I’ve actually had this recipe ready to go for a while now, ever since my whole week of Asian recipes. There just wasn’t enough time to share this one as well! Which is too bad since it might just be my favourite of all of them. No – that lemon chicken is pretty much amazing. But so is this chicken chow mein. I can’t pick – I like food, and trying new recipes, and apparently making Chinese takeout! The best part of this recipe though is that it is so incredibly easy! Fast, easy and absolutely delicious. You really don’t need much more from a recipe as far as I’m concerned. I’ve made this recipe at least three times now, which is already saying something about it. If a food blogger is making something three times in under a month you know it’s good. Because I don’t make a lot of things over and over again – always gotta be trying something new! Drives my family crazy. But they were very happy that this one was so good that I made it over and over again. And I will definitely continue to do so! Plus, you can customize it to your liking. Don’t like those veggies? Use something else, or whatever you happen to have in the fridge. Different protein? Sure. I’ve made it with chicken, shrimp and beef and all of them were great. I think I’m partial to the chicken chow mein, but use whatever you prefer. This chicken chow mein is so tasty. And so fast. And so easy. You definitely need to try it. So much better than takeout, I promise. 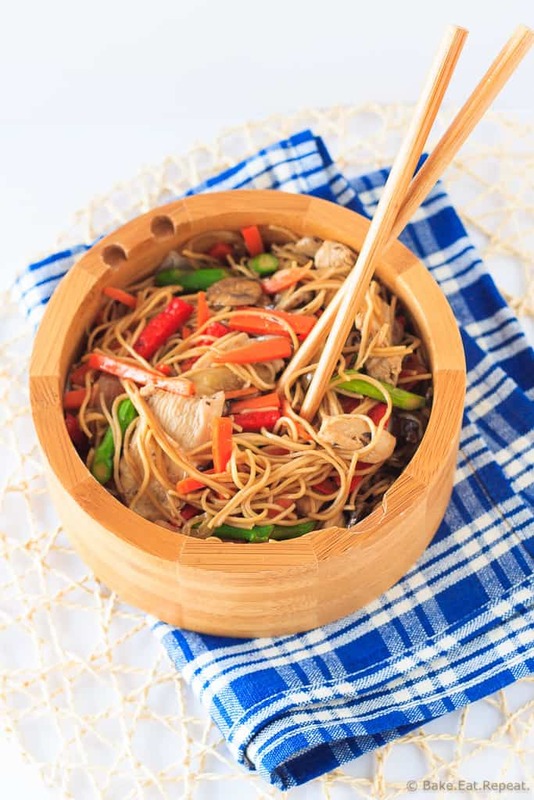 I didn’t even think I liked chow mein – that’s how much better it is! In a medium bowl, combine the chicken with the soy sauce and cooking sherry, stirring to coat, and allow to marinate at room temperature for 10-15 minutes. Cook the noodles in a large pot of boiling water, according to the package directions, about 2 minutes, or until just tender. In a large skillet or wok, heat one tablespoon of the oil over medium heat. Add the marinated chicken and cook, stirring until just cooked through, about 3-4 minutes. Remove to another bowl and cover with foil to keep warm. Add another splash of oil, and all the vegetables to the skillet. Stir fry the veggies until tender crisp, 2-3 minutes, then remove to another bowl and cover to keep warm. Add a bit more oil to the pan to heat. In a small bowl, whisk together the chicken broth, hoisin sauce, black pepper and garlic. Set aside. Add the cooked noodles to the skillet and stir fry for 2-3 minutes, until they are heated through and starting to turn golden. Make a well in the center of the noodles and pour in the sauce. Add back the chicken and veggies, and stir everything to coat it all with the sauce. Continue to cook until everything is heated through. Source: Adapted from The Chinese Takeout Cookbook . Hi Adah - you can substitute with dry white wine or apple cider, or just leave it out if you like. Hope you like the chow mein! I love chinese take-out, but sometimes you never know what your going to get. And frankly, I have been to more than my fair share of sketchy hole-in-the-wall places in search of something to satisfy my craving. I am totally making this next week. It's so good Rachel - I actually just bought more egg noodles at the store today so I could make it again. I'm completely addicted! Thanks! Yumm! Nothing like Chow Mein after a hard day of work! Awesome blog you have here. Are you interested in becoming Chicory App 's official recipe partner? Thanks! I'm not sure, but you can certainly send me some information on it via my contact form. This Chicken Chow Mein looks better than anything I've ever got from take-out or delivery. It must be fantastic if you made it 3 times in 1 month! I definitely need to put this on my to do list. Seriously - that doesn't happen often around here, much to the chagrin of my family! Thanks Rachelle! I don't make nearly enough Chinese take-out at home. I need to change this asap! Loving this recipe, Stacey! Yum! You do! So good! Thanks Justine! Never made chicken chow mein, but I can easily get addicted to this one! Love this dish! And your pictures are beautiful! Pinning! Now this is my kinda dinner! Totally customizable is the dream dinner! Making Chinese food at home can be addicting! Especially if you haven't had it in 10 years. This chow mein look amazing! Exactly, I can't stop now, it's all I want to make! Thanks Kelley! Stacey your asian food always has me craving for some. This chow mien looks delicious and I wish I could have that bowl right there. I tried chow mien once and it was a disaster. I think I need to change that and make this asap! Pinned!! Yes, you do - it's amazing! And easy, it wouldn't be a disaster! :) Thanks Cyndi! Making your own takeout is just the best! Where do you get you rice noodles? The first 'married meal' Dom and I made was chicken and cashews using the wok we received as a wedding gift. We've loved homemade Chinese food for 27 years! There is no comparison and this dish is no exception! Pinned! 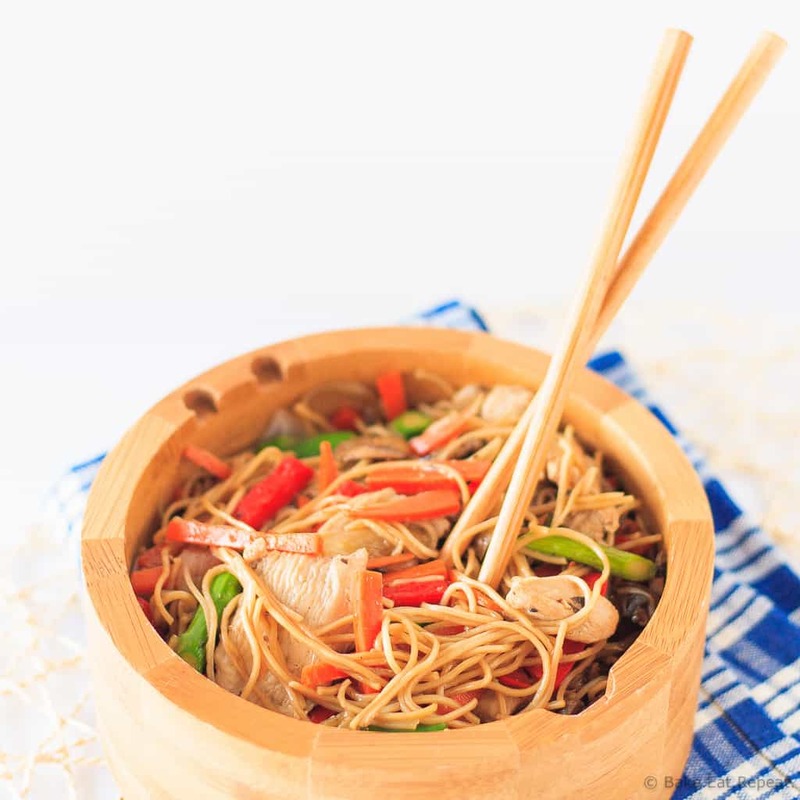 I looooove chow mein but I've never made it at home! I can't wait to try your recipe. So easy, you should definitely try it! Thanks Amanda! I'm a huge fan of chow mein! This one looks delicious; so much better than takeout. I am the same way. If I make something 3 times, I really, really, really like it! 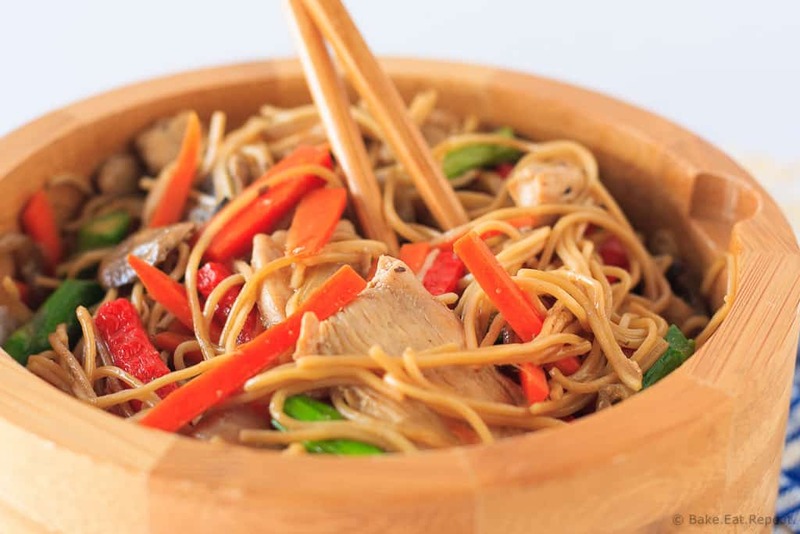 This chow mein sure does look like a winner! Right? Otherwise it's always new stuff happening around here! This one was a favourite for sure! Thanks Christin! Love chow mein! It's a favorite at our house. This looks delicious and totally way better than take-out! I also love making my own chinese food! I can't to try this recipe! I'm so glad I decided to try it - so much better than takeout! Thanks Roxana! Chowmein was my favorite food growing up. Thanks for reminding me how good this tastes and I am in love with your version with chicken! Yummy. Oh YES, this is definitely on my "must try" list! Looks amazing! I love Chinese food out at restaurants, but isn't it amazing how great it can be at home? Your recipe looks fabulous and so easy to whip up! Cheers! You're on a chinese food roll, Stacey! I love it! This chow mein looks delicious. It's one of my favorite things to order, but I've never made it before. I definitely need to change that! You do! Seriously, I've never enjoyed it when it comes to takeout, but I loved this! Thanks Gayle! This is definitely going on our dinner menu for next week! haha I love recreating asian take out dishes at home too! And you are so right - they are so easy to customize to your tastes. This looks wonderful! Being addicted to your own food is a good sign, Stacey! Means you're doing something super duper right. And to be completely honest, this looks amazing. I wish you'd be in charge of my takeout! Your Chinese takeout food at home looks way better than anything we could get at the restaurant! Wow! So excited to give this a try!